In Valencia, wide plazas connect narrow streets, ultra-modern buildings stand alongside medieval monuments, and exquisite food is sold on the cheap. Add to that a mild Mediterranean climate and endless beaches, and you’ll wonder why Valencia is still overshadowed by Barcelona. Sure, Barcelona’s cultural attractions and nightlife are legendary, but so are the crowds. For a less touristy and more authentic experience on your Spanish getaway, look no further than Valencia. Here’s what to do. Valencia is large enough to get lost in but small enough to feel like home. With a population of 800,000, Valencia is the third-largest city in Spain. It’s one of the busiest ports in the Mediterranean, but you wouldn’t know that when walking down its streets. 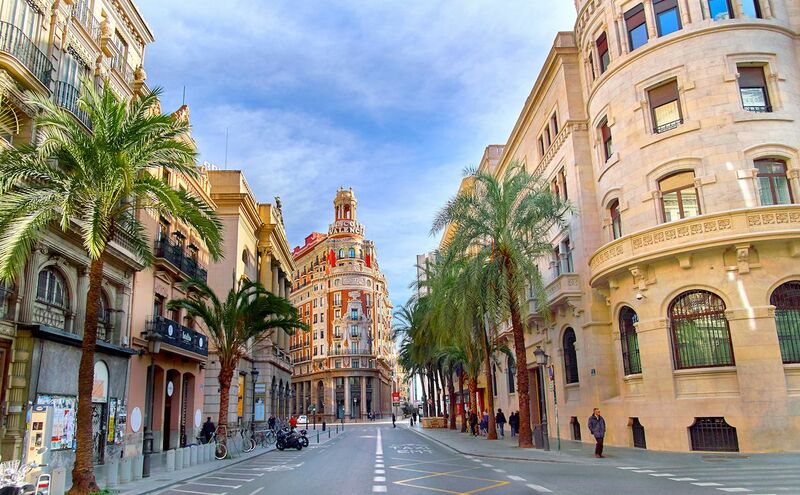 As you stroll through the Ciutat Vella, Valencia’s historic center, you’ll feel like you’ve stepped back in time. Google Maps is no match for the maze of narrow passages that crisscross around its main squares. Once in a while, you’ll inadvertently stumble into a medieval palace or church and are sure to feel that same adrenaline rush that ancient explorers once felt. It’s easy to venture off the beaten path, but it’s also nice that there is always a lively plaza right around the corner. Valencia’s cozy quarters make you feel like a local, even if you’re just visiting for a weekend. The city is looking to the future. Though there’s a medieval flair in the air, the space age is not a galaxy away. 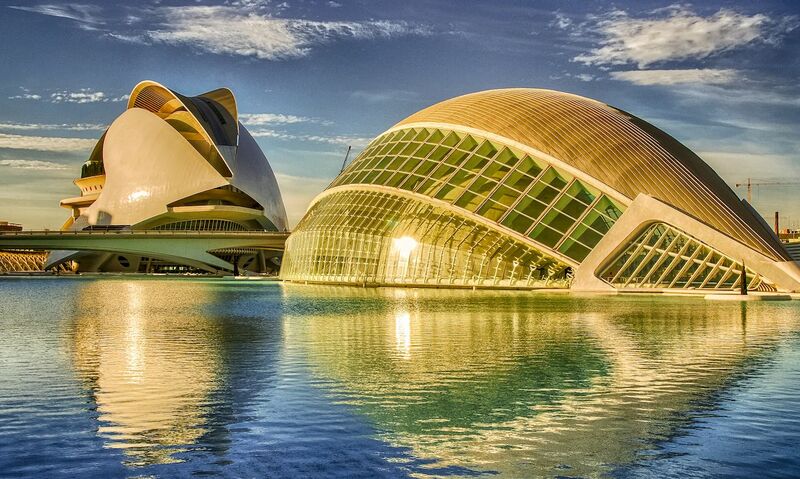 Valencia’s City of Arts and Sciences is the closest you can get to the year 3000, offering an experience sure to bring out both the nerd and culture hound in you. Designed by the acclaimed architect Santiago Calatrava, this complex of ultra-modern buildings has a state-of-the-art planetarium, opera house, and museum of science. You’ll also discover the largest aquarium in all of Europe, L’Oceanogràfic, which is home to over 45,000 marine animals. From its eccentric architecture to its mind-boggling exhibits, the City of Arts and Sciences is both awe-inspiring and enlightening. Party like the locals during the festival of Las Fallas. Every March, Valencia welcomes the spring by transforming the streets into an open-air festival called Las Fallas. 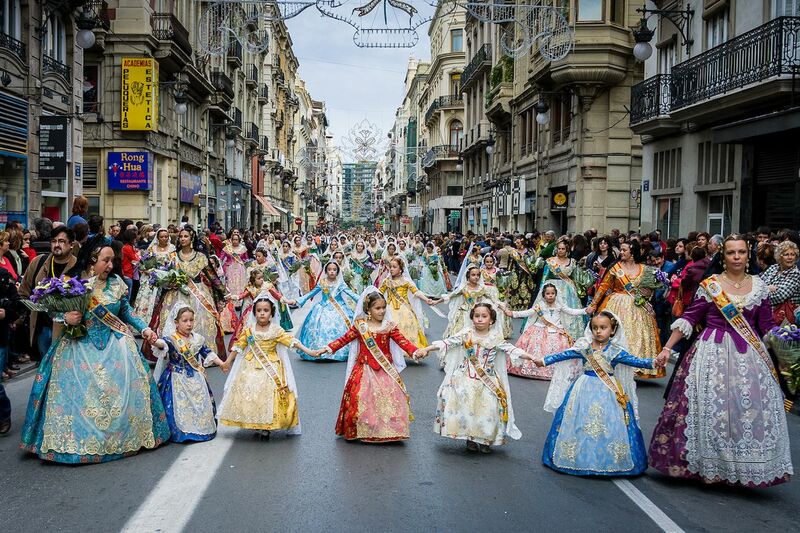 Originally a celebration for the patron Saint Joseph, Las Fallas has evolved into a 19-day fiesta that’s become the hallmark of Valencia’s cultural identity. Each day kicks off with a thundering wake-up call, as brass bands march down the streets. Madness ensues with noisy firecrackers setting off car alarms as people dressed in quirky costumes dance in the streets. And this is just the morning. The fun continues into the afternoon when the live music, firecrackers, and rhythmic processions escalate to a fever pitch and you might just find yourself jumping into the fun. During the final night of Las Fallas, the celebrations reach their climax when paper-mâché creations, effigies, and parade floats are set ablaze. This fiery, epic ending underscores the explosive nature of these festivities. Las Fallas is so extraordinary that UNESCO deems it an Intangible Cultural Heritage of Humanity. You won’t find anything more engaging this side of the Edinburgh Festival. Wander aimlessly through one of Europe’s largest urban parks. No city is complete without its green spaces. 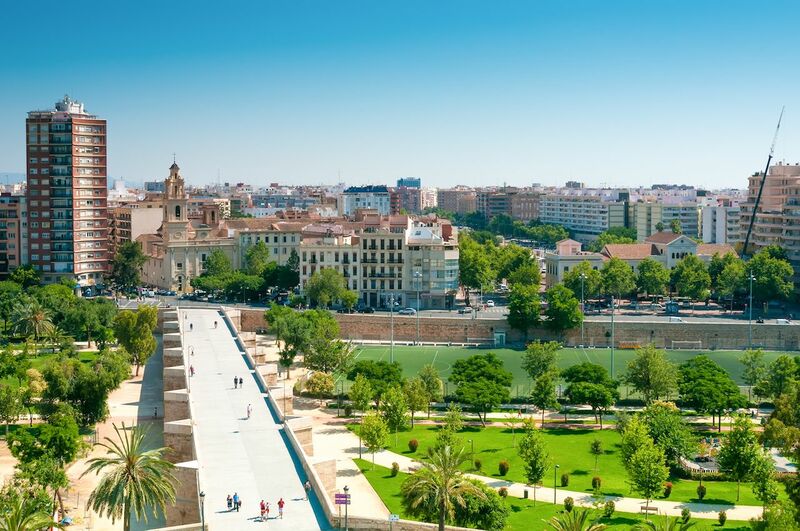 Spend some time exploring Valencia and it won’t be long until you come across the Jardí del Túria, one of Europe’s largest urban parks. Formerly a river notorious for flooding, the Túria was diverted south of Valencia and the riverbed left behind was converted into a park. Today, this greenway runs over four miles through the heart of the city. Along the Túria, you’ll find pretty much everything that makes a massive public park awesome: bike paths, gardens, fountains, soccer fields, exercise equipment, cafés, museums, and even a zoo. The Túria also has the Gulliver Park, a playground that resembles Lemuel Gulliver, the fictional character from Jonathan Swift’s Gulliver’s Travels. If you fancy a pedal, there are plenty of public bikes to help you traverse the Túria. The paths are wide and well-maintained, making for a smooth ride. If you plan to stay in Valencia for an extended period of time, it’s advisable to get an annual Valenbisi bike card (only costs 29.21 euros, about $33). With its flat terrain and bike-friendly passages, Valencia without a bike is like Venice without a gondola. This enormous park helps make Valencia one of the most livable cities in the world. The cuisine is uniquely Valencian. As the birthplace of paella, Valencia has a dynamic food scene that is among the best in Spain. Valencia’s Mercat Central, or Central Market, is the best spot in town for indulging in local cuisine. As one of the largest markets in Europe, you’ll find just about everything here, from fresh fruits and vegetables to fish, meat, and sweet confections. 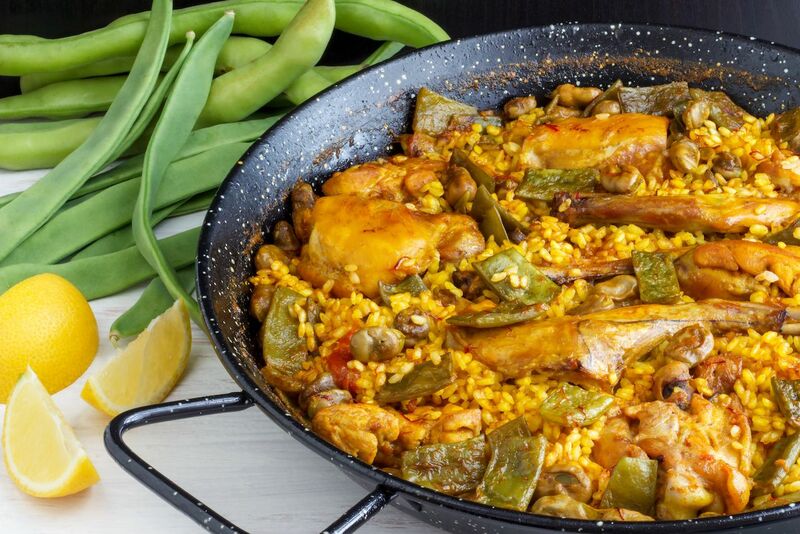 The local specialty in Valencia is the Paella Valenciana, a traditional rice dish mixed with rabbit, chicken, beans, and peppers. The vegetable and seafood paellas are equally popular. But Valencia isn’t just a city of rice dishes. Given that the region straddles the Mediterranean Sea, the catch of the day is another important element of the Valencian diet. For the fearless foodie, try the all-i-pebre, a local delicacy served with chunks of eel, potatoes, almonds, garlic, and paprika. Even if eel doesn’t entice you, you must try at least a bite during your stay. Oranges are another staple of Valencian cuisine. From the city’s main train station to its tucked-away plazas, Valencia is lined with orange trees, and until the 20th century, citrus fruits were one of its largest exports. As a result, one of the city’s most popular cocktails is the Agua de Valencia, a mix of orange juice, sparkling wine, vodka, and gin. Agua de Valencia is the drink of choice during social gatherings for those over 16 years old (Spain’s legal drinking age, with limitations). For a refreshing non-alcoholic beverage, the Valencians worship their horchata de chufa, essentially Valencia’s substitute for ice cream. This dish is a tiger-nut milk drink served with sweet pastries called fartons. Drinking horchata on a hot summer’s day is a Valencian past time — and an appropriate one as there’s no shortage of hot days. Hit the beach to bask in the sun — not the crowds. 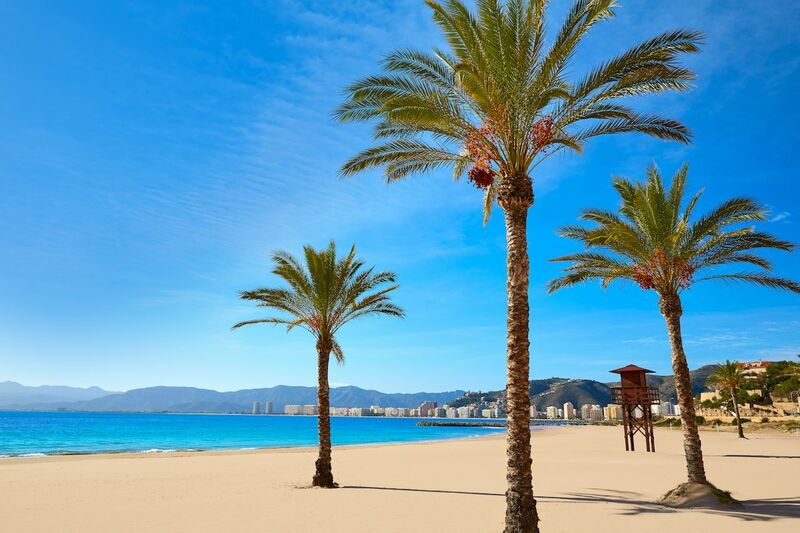 If you’re ready for some R&R after exploring and savoring the local delicacies, there’s no better way to spend your Spanish siesta than at the beach. Valencia has three beaches just 15 minutes from the city center, where golden sand stretches past the beachside cafés, restaurants, beach clubs, and volleyball courts that line the waters. If you don’t mind venturing six miles outside of the city, the beaches are even more secluded and untouched. You’ll be rewarded with an ideal spot to enjoy a glass of Agua de Valencia and watch the sunset. The only pressing thing on your mind will be the impending decision to hit the beach clubs or your hotel room bed. It’s a wonder why Valencia has stayed out of the limelight for so long.